In January 1830, Agnes Magnúsdóttir became the last person executed in Iceland. She was accused, along with Fridrik Sigurdsson and Sigrídur Gudmundsdóttir, of the murder of Natan Ketilsson and Pétur Jónsson (the former her employer) in March 1828. Of the three, only Agnes and Fridrik were executed. Sigrídur's sentence was commuted to life imprisonment in Copenhagen. It was presumed that her youthfulness made her suggestible and thus influenced by the others.This story is of her final months with the family of District Officer Jón Jónsson. Kent's prose is sparse, befitting the setting. The District Commissioner and one of his servants are distinguished simply by their coats; 'bright red' for the former, and 'worn' for the latter. One can readily imagine the fierce winds whipping across the skins used to cover windows. Written alternately in the third and first persons, some readers might feel some disorientation moving between modes. But it is well handled in Kent's deft prose. 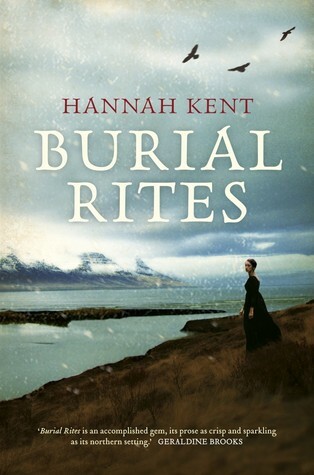 Reading Burial Rites gives you the sense of a writer in command of their craft. This impression is confirmed by the research that the author has undertaken. While the work is obviously an imagining of Agnes' thoughts (and of what really happened), it is clear that much research has informed the writer's views. What I also found particularly impressive was that, though there was a lot of knowledge behind the writing, the writing never became a display tableau for it. In general, the characters are well drawn. The District Commissioner is not simply keen for the executions to serve as a deterrent to the district's peasants (though he is certainly that). He expresses a desire for the islanders to share the modernisation enjoyed in Denmark, for example by having glass windows. The Assistant Priest's attraction to his charge is deftly drawn. If I were to level one criticism, it would simply be that we don't feel the antagonism towards Agnes felt by most of the Jónsson family (in particular). While we slowly see the relationships between them thaw, we don't feel the revelation that they did. Instead, we feel that she cannot be guilty of murder, and simply await the truth to be revealed. What we have here is a wonderfully told story of a woman whose own was ignored. It is a story that you should hear. Sign into Goodreads to see if any of your friends have read Burial Rites.